Heat oil in a tawa, fry the whole spices until they turns brown, add the chopped onions,slit opened green chillies and ginger garlic paste until the onions turns transculent, add now the chopped eggplants, saute until the veggies gets half cooked..
Add the garam masala powder, red chilly powder and coriander powder and salt,cook everything in simmer,sprinkle water and cook until the veggies get well coated with the spices..Add the cooked rice to the cooked veggis and toss gently well until the rice gets well mixed..
Super recipe! Loved it priya! Thats very new to me and seems to be tasty. Yumm and tasty Brinjal Pulao dear.Luks invitingly good.Luv it. I wish i had this rice for lunch. I am having bland belgian food for lunch today. wow ! we make vangibhath out of Brinjal n was going to send you that recipe ! this one with coconut milk looks good ! Lovely recipe Priya...looks so good and yummy! Naaku ooruthu Priya!!! Very very tempting!!!! Tasty and tempting. Love it. loved the use of coconut milk..sounds very delish. Such a tasty pulao! It looks delicious! Looks yummy !! delicious rice !! Appealing and healthy pulao..looks delish! looks nice any recipe with coconut milk tastes yum. Love anything with eggplant..looks very tasty! wow looks yum! Should try it. . .
Lovely pulao/ will try for sure. Wow that's new to me..
Pas de doute, c'est certainement délicieux. Delicious one pot meal,simple and healthy..
wow, wow, wow, that looks superb !!! Looks so flavorful and yummy! Yummy and flavourful rice Priya.One pot meal is one great idea ! I am totally addicted to kathrikkai pulao! Adding coconut milk is a nice idea! Hmmm what a fabulous pulav and a great way to eat veggies too.I have zucchini and I was not sure I wanted to cook it the same way as I usually do,so I am making this pulav with zucchini instead of eggplant.Thanks for this brilliant idea Priya:)!!! 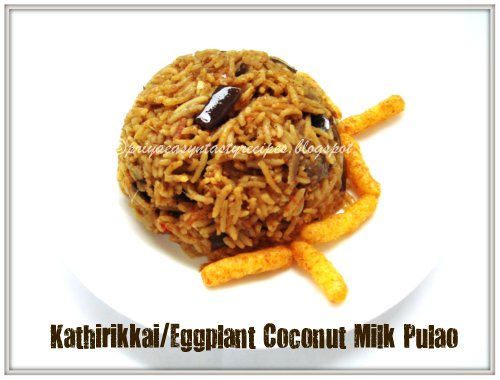 pulao with only eggplant!..thats yum!...with coconut milk very flavorful too...I like adding coconut milk to any pulao! One simple word - Wow!! Looks fab! Love kathrikkai in all forms, I have a kathrikkai quinoa in my drafts will post and send you soon for the lunch box event. I make brinjal pulao but never added coconut milk! Great lunch box idea! How you manage to dish out so wonderful recipes Priya? the pulao sounds so yum. Priya, thanks for another great eggplant recipe. It's our favorite veggie by far. I'll try and send something in to your event.